এক নাগাড়ে তিন দশকের বেশি সময় তিনি একজন কংগ্রেসম্যান হিসেবে তার এলাকার প্রতিনিধিত্ব করেছেন। রাজনীতির সাথে জড়িত জিম ক্ষুরধার বুদ্ধিমত্তা, দূরদর্শী, জ্ঞানী এবং অভিজ্ঞ একজন বিশেষ প্রভাবশালী ক্ষমতাধর ব্যাক্তি আমেরিকার ক্ষমতা বলয়ে। সরকার আসে যায়, কিন্তু তার প্রভাবে এতে কোনও তারতম্য ঘটে না। কারণ, নীতি নির্ধারকদের সাথে তার রয়েছে দীর্ঘ দিনের ঘনিষ্ঠতা। তাই রিপাবলিকানই হউক কিংবা ডেমোক্র্যাট সবাই তাকে বিশেষ সমীহ ও শ্রদ্ধার সাথে তোয়াজ করে চলে সেটাই দেখে এসেছি। চা-নাস্তার অর্ডার দিয়ে বসলাম তিন বন্ধু। প্রথমেই আমি জিম এবং তার মাধ্যমে অন্যান্য বন্ধুদের ব্যক্তিগত ভাবে আন্তরিক কৃতজ্ঞতা জানালাম প্রাকৃতিক ঘূর্ণিঝড়ে বিপর্যস্ত জনগণের ত্রাণ এবং পুনর্বাসনের স্বার্থে যে মানবিক সিদ্ধান্ত গ্রহণ করা হয়েছিলো তার জন্য। প্রধানমন্ত্রীও তাদের অবদানের জন্য লিখিত ধন্যবাদ জানিয়ে কৃতজ্ঞতা প্রকাশ করেছেন, বলেই খালেদা জিয়ার সই করা আমারই লেখা চিঠিগুলো জিমের হাতে তুলে দিলাম, সাথে তিনি যে আমাকে তার বিশেষ দূত হিসেবে পাঠিয়েছেন সেই চিঠিটাও। এবার বলো, ‘অপারেশন সি এঞ্জেলস’ এর ফলাফল কেমন হচ্ছে এবং বাংলাদেশী জনগণের প্রতিক্রিয়া কি? Suddenly it came to my mind why not to enquire about the well fare of His Excellency Sree Kasm Sree and his lady wife. He is related to the King’s family and then was the Deputy Foreign Minister. We were together at Piking. At that time the American Ambassador was senior George Bush, British ambassador was Sir. Edward Yude, Indian Ambassador was Rama Shwami Vengkot Raman. He was a lower cast Tamil Hindu. He was an intellectual, a liberal writer, philosopher and a political analyst. Once in one of the annual tours organized by the Foreign Ministry for the diplomats we spent as the room mates for 10-12 days. During that time I had the opportunity to learn manythings from this distinguished scolar about socio-economic condition of India, polity, conflicts about nationalism, cultural diversity, cast conflicts, religious intolerance by holding open minded discussions. I had also developed close friendship with Bill Gilliland of US Embassy posted for covered job. Rechard, the head of the political wing of the British Embassy, Gp. Capt. Sani, the military Advisor of Pakistan Embassy and Mr. Basharat, the 2nd Secretary. We were all Tennis addicts therefore every afternoon we uded to get together at the International Diplomatic Club in Wang Fu Ching. While playing we used to exchange views on all other topics of interests. Later George Bush and Vengkot Raman both had became the President of their countries. Sir Edward Yude was posted as the last British Governor to Hong Kong as well as the chief negotiator on behalf of the British government to negotiate with the Chinese authorities about the future of Hong Kong. At that time I was also posted in Hong Kong. By then the Portugal had already returned the sovereignity of Macau to China as China did not want to renew the lease after its expiry. But Hong Kong was quite a complex issue. After securing 99 years lease British and its other Western allies established a capitalist socio-economic structure. Therefore, there remained some apprehension about communism not only among the rich but also commoners of Hong Kong. Taking the advantage of this uncertainity and fobia The British government wanted either to extend the lease or complete right of self-determination for Hong Kong. Both the proposals were not considered acceptable to the Chinese government. Their position was that on expiry of the lease, sovereignty of the Peoples Republic of China would be imposed on Hong Kong and ‘One Country and Two System’ would be introduced in Hong Kong. When this negotiation was on suddenly the ‘Folk Land’ war broke out. And in that uneven war Argentina was defeated by Britain. What should I say? The illiterate woman is sermoning about the wrong history! The Queen being inquisitive wanted to know from Sir. Yude sitting next to her and fluent in Chinese language what was transpiring between the interpretor and Mr. Temg Xiao Ping. At that point of time some how Sir Yude could manage to evade the answer. Any hiow after that one sided meeting and the Banquet before calling it a night the Queen once again insisted to know the same from Sir Yude. Against his conscience being pestered Sir Yude had to tell Her Majisty the truth. Hearing what Sir. Yude had said the Queen was almost falling down on the floor but as some attendants had quickly got hold of her she survived from that accident. In one of the exclusive dinner Sir. Yude himself had narrated that amusing incident to me and Nimmi. At the fag end of the Cino-British negotiation one morning I was heading towards my office suddenly I heard an announcement from the car radio that a while ago my dear friend Sir. Yude the Governor of Hong Kong, had passed away due to a sudden heart attack! Hearing such an unexpected news I as well as Mr. Chen my good old friend and chauffer were deeply shocked! I asked Chen to drive back home. From the residence I got Nimmi along and returned to the Governor House. My car was well known to the staffs at the Governor House because, as being an old friend he often used to call for me or I and Nimmi as a couple used to be invited over lunch or dinner. As we entered I noticed a flock of journalists and Media Anchors. As we stepped out from the car one of the young lady journalist came to me quickly and after introducing herself and said that she was aware that we are long standing close friends of the Yude family. Therefore, she wanted to know, as a close friend what was my instant reaction at the sudden news of unexpected demise of Sir. Yude the Governor? At the sudden demise of Sir Yude, me and my wife had lost a sincere friend. The characteristics of the couple is unique! They are not artificial in their modesty and guesture. They also charish sincere love and affection for their friends. Sir. Yude was a far sighted, knowledgable and astute diplomat. How are you keeping? From where you are speaking? From the VIP lounge at the Bangkok Airport. On way to PRC as a special envoy of the newly elected Prime Minister Begum Khaleda Zia on a important mission. This is a very good news indeed! If you meet any old common friend there then do convey my regards. After the sudden sad demise of our old friend Sir Yude I saw your instant reaction that was broadcasted by the Hong Kong TV. The way you had left Piking that surprised all of us. Later after knowing everything we all had been thinking about you and the family. After the death of President Zia we, I mean all the common friends became gravely concerned. Later, after you were posted in Hong Kong we all had a sigh of relief. How long would be the trip this time? Haven’t met for long so, I am requesting you if we can meet on your way back then I would be very much happy. Hopefully, I would be able to return after 3-4 days. Before you return just give me a call then I shall make all arrangements for you to be my guest here and ask your old friend Pichai Fung Bhat to receive you at the airport. Is Nimmi travelling with you? No Your Exellency, this time I had left her at Dhaka. No problem, there can always be a next time. Wish you all the best and success in your mission. Thanks a lot Your Excellency, do convey our warm regards and best of wishes to Madame. Its boarding time now, so must say good bye. I droped the line. Thanks a lot Your Excellency, do convey our warm regards and best of wishes to Madame. Its boarding time now, so must say good bye. I reached Hong Kong in time by Thai Airways flight. Hong Kong is well known to me. I booked myself for Canton in a CAAC flight next day afternoon. From the Kai Tak airport I reached Peninsula with a hotel Limousine. I had served couple of years as the ‘Doyen of the Diplomatic Corps’ in Hong Kong so, personally was known to the managements of most the famous hotels. That helped me easily to get a room without any prior booking. After I was shown to the room I took a shower and straight away went to bed. Next day morning I called my dear friend Mr. Lum. The Chinese friends had introduced me to Mr. Lum, an well established businessman when I was in Hong Kong. There after with time we became family friends. I requested him to come to the hotel. Then I called some of the good old friends. Everyone was egger to meet me. I told them I am on my way to Piking on a mission. From Piking I shall call Linda to arrange a get together of all close friends who are available at the Hong Kong Country Club on my way back. Before I leave Piking I shall inform Linda the date and time that would be suitable. Linda then shall contact you all accordingly. Everyone agreed. Then I called Linda. It was a great surprise for Linda to receive a call from me after a long time. Last night. Listen, I am leaving for Piking to day on a special mission. I shall talk to you in details from there. On my way back I would like to meet all our old friends those are available particularly you. You have to arrange everything my dear. As I have to attend an important meeting so, reluctantly I must say good bye now. I shall wait for your call from Piking. Great! I droped the line. After talking to Linda I was waiting for Lum’s arrival. Shortly, Lum entered my room. As I told him about the purpose of my visit Lum advised me to talk to Comrade Lai in Canton. I called Comrade Lai and that because of shortage of time I am arriving Canton this afternoon without any prior intimation and Lum was sitting next to me. No problem! Comrade Wu would receive you at the airport himself. Lum would make you seated in the CAAC flight. Give the receiver to Lum so that I can explain everything to him. Lum gave my flight details to Comrade Lai and had a short chat with him and droped the line. Do get in touch on your return. We climed down the staires and the waiting car drove us to the VIP lounge. Within a short time one of the colleagues came with my luggage after completing all other formalities. We came out from the airport. Wu escorted me to a Marcedese-600. There was another same type of car at the back in which his two colleagues got in with my luggage. Comrade Wu had graduated from the Piking Language Institute in English so, was fluent in English both speaking writing. He at times works as the interpretor in the important meetings between the Chinese leaders and the foreign heads of state or heads of government. After a while we reached at the state guest house which is well known to me. Comrade Yu Yi and Comrade Lai were waiting to welcome me. It was a get to gather of old friends after quite some time. After exchanging greetings and enquiring each other’s welfare as Comrade Ma was not around I enquired from Lai where is he? Comrade Ma has been elected to the Central Exicutive Comitee of the Communist Party so he has shifted to Piking. I was very happy to know such a good news. After dinner we all sat down. I informed them in details about my mission this time and also the agenda. Kamal had prepared the agenda in consultation with Khaleda Zia and handed over to me. After listning everything carefully Comrase Yu Yi and Comrade Ma both opined that I have to go to Piking tomorrow along with Comrade Wu. There comrade Ma would be guiding me in which way we have to proceed and he himself personally would be playing his part so that my visit becomes successful. We shall inform him to day about your arrival, mission and agenda. We shall also be informing him that you are reaching Piking tomorrow along with Comrade Wu. Comrade Wu then said you take some rest and we shall be back after two hours or so. I could understand they are going away to get in touch with Comrade Ma and fix up everything. I had been mixing with the Chinese people intimately at different levels for long. Out of the character of the whole nation those which had over whelmed me are their discipline, sincerity, steadfastness, work ethics, sense of time and genuine friendly affection. There is a old saying, ‘It is extremely difficult to befriend a Chinese. But should the Chinese take some one as a friend then they want to retain that friendship from generation to generation’. I firmly beleave that without those character traits no nation can move ahead towards prosperity and progress maintaining it’s self dignity. All the Comrades returned back. All arrangements have been made. Comrade Ma will personally be at the airport to receive you. We think this visit of yours would go well and be fruitfull as this time you are going to Piking as personal friend and a special guest of Comrade Ma. By the way, on your request we had organized a tour for Dr. Kamal Siddiqi and family before he was leaving China for Bangladesh after completing his term of service at the Bangladesh Embassy in Piking. How is he keeping? Kamal and his family were extremely happy being able to avail the opportunity of that uxurious tour you had arranged. Now he has become the Principal Secretary to the Prime Minister. That means the most powerfull bureaucrate. Before my departure he specially requested me to convey on their behalf once again their sincere gratitude to you all for arranging that memorable grand tour. Is that so? It is realy a good news! Mr. Sabbhiuddin who had worked with me as the 1st Secretary for three years in Hong Kong Mission is now the PS to the Prime Minister Khaleda Zia. It is really a strange combination indeed! Said Wu. Comrade Wu had met Sabbhi at the Hong Kong Mission. He even talked to Sabbhi but Sabbhi could never know the real identity of Wu. He knew that Wu was a well established businessman in Hong Kong and my personal friend. Comrade Lum’s identity was the same to him as well. All the friends were upset and charged why I did not bring Nimmi and Shosti along. I had to explain to them that I wanted to keep this visit a secret that’s why I had to leave them behind at Dhaka this time. Next day on time the friends saw us off at the airport. I and Wu took off for Piking. We reached Piking. Comrade Ma and his colleagues came inside the plane and greeted me warmly and took us to the VIP Lounge. All formalities were completed quickly and we came out. I was amazed to see the newly built huge International airport of international standard with all the latest modern facilities. On the way the roads, flyovers, under passes and high ways were astounding! On both side well planned high rises baffled me! I was unable to recognize the old Piking that I knew so well. Our motorcade reached in front of one of the state guest house. There was no change in this prestigious restricted area which bears the sign of historical heritage of China. It looked the same. The attendants were waiting for our arrival. They took away all my luggage. Comrade Ma took me and Wu to a sitting room. Now tell me how are you keeping? How is Nimmi and Shosti? Lai has already made me understand the reason for which you did not bring them along this time. It is lomg that they haven’t visited China so you would be bringing them for a visit at your earliest opportunity that is what we all shall be expecting. Surely, I shall be doing that. Yu Yi and Lai had explained everything regarding your mission this time so just give me the written agenda. My dear friend, whatever might be your decision I would like to know that at the earliest and go back. As the Foreign Minister failed to get any positive response after submitting the request to the Chinese Ambassador at Dhaka the Prime Minister all most forced me to come as her special envoy with this misson and I as a government servant had to reluctantly exceeded to her request. Our friend Dr. Kamal Siddiqi is now PM’s Principal Secretary. I presume it is he who might have told the Prime Minister that if she can manage to send me here as her special envoy then perhaps the invitation for the state visit at the earliest could be achieved. Now everything is in your hands though the issue is embarrassing to some extent just like late Gen. Zia. You had saved him by inviting as the Chief Martial Law Administrator(CMLA)to visit China. Now, similarly if possible you have to save his lady wife inviting her on a state visit so that she does not have to start her visits of the foreign countries with India. I do not know whether considering every aspects whether it would be at all possible to invite her within such a short time but Comrade I feel, if you can find some way to accommodate her for a state visit resolving her present pressing problem then that would definitely leave a long term positive impact to carry forward the existing bilateral relation between China and Bangladesh to greater hights. By the way, tomorrow one of your dear friend would come to meet you. He has just returned from a visit to Bangladesh. A few more old friends who expressed their desire to meet their dear friend Mr. Haq had also been invited to join the lunch. Comrade Ma left along with Wu. After dinner I requested an attendant to wake me up at 7AM and got into the bed. Laying on the bed I was thinking about the effectiveness of the administrative institutions and their efficient and prompt decision making process. On the basis of the principle ‘Democratic Centralism’ every institution and organ of the party and administration had been flawlessly developed at every tire from the state to grass root level. Between all the institutions and organs there is uninterrupted co-ordination and all time communication system. The prudence of the leaders with vision, wisdom and vast experience and the pro people progressive rules, regulations and the laws that are enacted compatible to the time does not allow any westage of time in the decision making process at any level. Decision taken at the highest level to resolve any difficult problem trickles down to the grass root level and implemented instantly through out the country without westage of any time. In such a big land mass to develop such infrastructures through out the whole country is not only incredible but also unbelievable! One must get stunt to see the efficiency and transparency of the state and administrative structures. Through out PRC there is no ‘Red Tapism’. Which is glaringly visible not only in the 3ed world countries but even in the developed countries as well. Here no one can weigh the power of any leader looking at his formal position. From the bottom to the highest level where is the center of power exists or who are the people who holds real power that mistry could not be unfolded by any one till this date. When the historic episode at Thien Mien Squire took place I was in Hong Kong. Basically, from Hong Kong America, Britain and their other powerfull allied countries of the West unitedly taking long time and spending millions of Dollars had succeeded to penetrate and conspire within the student communities of the city based universities and colleges and managed to organize a sit down protest gathering of young boys and girls at the largest paved squire of the world Thien Men Squire raising the demand of human and democratic rights. In that gathering children of many top level leaders also participated. At first the authorities urged the protesters to vacate the premise within the stipulated time frame as decided. As the agitating protesters did not pay any heed to the plea and the stipulated time frame was over, the authorities launched a massive Blitz Krieg operation and killed about 12 thousand defiyent students boys and girls on the charge of creating anarchy at the capital as the revolutionary leader Lee Kuan Yu had done immediately after he took over power in newly independent Singapore when the defeated colonial British government tried to destabilize Singapore organizing a bloody athnical strife. Freedom Fighter Lee Kuan Yu heavy handedly killed about 15 thousand ring leaders who were associated with that athnic riot to maintain stability. After quelling the riot he proclaimed, ‘In independent Singapore every citizen shall have only one identity that is Singaporian nothing else. Those who can not reconcile with this are allowed 48 hours to leave. After this time frame if the conspirators are found trying to stay back then they would also be up-rooted in the similar way’. Without such leadership, brave and firmly commited to nationalism it is just not possible for any 3ed world country to stride forward on the path of progress and prosperity. The next day the life in the whole country including Beijing became normal. For long through spending colossal amount of money covertly you had finally managed to stage the Thien Men Squire episode of decent gathering thousands of dissenting students but the Chinese leadership successfully quelled the defiant voice heavy handedly in one night killing thousands and from the very next day through out the country including Beijing normalcy was restored. Not only that scores of the ring leaders and activists associated with that episode were apprehended and their foreign sponsors were forced to accept them very easily. You could dismembered the USSR a super power into pieces, China is relatively much weaker a country but even then all your moves to fragment PRC so far have failed to achieve desired result. Why it is so, my friend? Till this date it had not been possible to locate a Gorvecheve in China. The corridors of power, the pillars of power within the party and PLA are so fortified that it is proving impossible to penetrate those impregnable cordon of iron shields. Tommorrow Comrade Xu Xing would convey the final decision of the Chinese government regarding Khaleda Zia’s visit. Where as in my own country even a simple decision can’t be expected at any level! The state structure, system of governance, leagal system imposed by the colonial masters can’t be effective for an independent country. These were structured to ensure the vested interests of the colonial countries not for the progress and socio-economic prosperity of the slaves. After the two world wars most of the colonial empires were devastated therefore they were forced to give independence to most of their colonies. Through understanding they saddled in the state power the local vested interested coteries created by them comprising of the ramnents of feudals and compradors. These coteries being the lackies of their erstwhile masters are ruling after even independence sacrificing the national interests with the pull and push of the strings attached to them keeping intact the colonial state structure, leagal system, administrative apparatus, socio-economic condition and national politics confined into their fist. As a result, nothing has changed but the slough of the exploitative ruling elites in most of the newly independent countries. The ‘Browns’ nurtured by the ‘Whites’ were allowed to capture the citadels of power. This parasite coteries as required very cunningly in the garb of so called democracy or dictatorship have been keeping the state power in their hands against the interests of the people. These coteries though not 1-2% of the entire population control the states and the societies. They have also usurped 80 to 85% of the national resources. 98-99% of the people being pressed under the steam roller of misrule and exploitation of that 1 to 2% all powerfull ruling coteries are virtually slaves. To them independence means just a national flag and a national anthem. In most of the underdeveloped and backward so called independent countries he sees only politicians but hardly finds any leader. The politicians are egger to be part of the state power only for their self interests. They endeavor to enhance their vested self interests keeping intact the colonial state and social structures. Their vision is only up to the elections. The leaders are the visionaries who have a clear perception about the hights where the present and future generations have to be led step by step within a specific time frame in view of the expectation of the people. Simulteniously whatever course is decided to be the best and realistic they must have firm conviction, courage and uncompromising commitment to charter that course. The brave freedom fighters of the present and future generations who would be commiting themselves in the struggle to extricate the country and the nation now submerged into rotten quick sand for the emancipation of the people for them the statement of Nelson Mandela would work as a beacon to find the right way that is what the writer believes. In light of the statement of this ealderly leader it can be said that the biggest hurdles on the way to progress and prosperity of most of the underdeveloped countries are the termited decadent colonial state structure, administrative, leagal, governing and political system as well as prevailing socio-economic condition which is called the ‘Status Quo’. For real independence and self reliant progress and prosperity it is imperative to bring fundamental changes in the existing system as quickly as possible to build a new progressive state, socio-economic and political system according to the expectation of the countrymen for the betterment of the vast majority of the people. If such an initiative is termed as revolution then that should not be a problem. But without such fundamental changes there would be no possibility ever to free the vast majority from the clutches of a tiny but powerful vested interested coterie created by the foreigners. Besides, in a society where equal opportunity to excel the talent, creative working skill and professional ability of the vast majority is denied that society can never advance on the way towards progress. It is also not possible to change the fate of any such nation. Many political leaders propagate to take the country and the nation towards progress and prosperity through evolutionary process maintaining the status quo. Such propaganda is not only confusing but irrational. The history bears that testimony. Every nation in this world has its separate identity based on its own way of life, heritage, values, culture, hope and aspiration. Denying this reality if any borrowed ediology is imposed forcefully on any nation that can’t bring any fruitfull result on the contrary such an attempt becomes suicidal. A self reliant independent country and a self respecting proud nation can only be built basing on its own values, culture, heritage, resources, talents, creativity and energetic working power of the people as a whole. All though, Comrade Xu Xing is a powerfull person but even then there is no doubt there had been many other invisible powerfull decision makers who had worked behind the scene to finalise the decision regarding Khaleda Zia’s visit. Long intimate relationship with the Chinese leaders has tought me this lesson. With all these stray thoughts at one time I fell asleep. As the telephone on the bedside table rang I woke up. From the other end a sweet female voice informed it is 7’clock in the morning. Sir, your bed tea, hope you had a good sleep? After knowing how huch sugar she while making the tea enquired when she should bring the brakefast. In the meeting only Comrade Xu Xing and Comrade Ma would be present and he would also be there as interpretor. I am heartily welcoming our tested friend on behalf of the Chinese leadership. Though we had never meet before but you are not unknown to me. This short remark of the veteran leader is meaningfull. There after we took our seats. The meeting started. As an old tested friend our talks would be free and frank, hope you wouldn’t mind? Excellency, your attitude is not only praise worthy but gratifying as well. Rather I am much obliged. After due deliberation on the purpose of your visit this time and the agenda I have been entrusted with the responsibility to convey the decision of the Chinese government to you. Before I reveal that I would like to say a few words on Cino-Bangladesh relation. Historically, the relation between China and Bangladesh is age old. Many decades back a Buddhist Monk named Sree Atsh Dipankar came to China from ancient Banga and started preaching Buddhism. The Chiese people embrassed that religion in Lacs and Crores. There after to preach Islam 29 deciples of Hajrat Shah Jalal(R)were sent to China again from the ancient Banga. Being attracted with the Islamic way of life and its values Crores and Croes of people accepted Islam as their faith and had became Muslim. According to our statistic more than 80 Crores of men and women in different provinces of China got converted into Islam. The ashes of the remain of Sree Atish Dipangkar were preserved with due respect at the Potala palace. Present Bangladesh was recognized as an independent country by the People’s Republic of China only after the political change that was brought through the successful revolutionary uprising of 15th August 1975. Later at the request of the Bangladesh government during the reign of Gen. Zia the preserved ashes of the remain were returned to Bangladesh. You had also contributed in this regard. The graves of those 29 Muslim preachers are well preserved within the parameter of the Mosque at Guangzuo that you have visited and seen with your own eyes while you were at Beijing. When you were at Beijing at your initiative a deligation comprising of the representatives on behalf of all the Muslim countries had met the concerned Chinese authorities and proposed to give permission to pray in all the mosques in China including the mosque at Beijing and to re-establish the practice to give Azan which is the call for prayers. The government of the People’s Republic of China accepting that proposal and made all required arrangements to execute that while you were still at Beijing. In this noble proposal what was your personal contribution that is also not unknown to us. like minded parties, knowledgable people in every sector of the society and the intellectuals. Our preserved written history of more than 4000 years teaches that lesson. The agenda of Sheikh Mujib, the supreme leader of East Pakistan and his party Awami League is separation and neighboring India was adding fuel to impliment his agenda. To preserve the unity of the sate the military Junta and all other patriotic political leaders and parties of Pakistan anonymously had decided that this conospiracy has to be faced taking any measure no matter how strong that might be. In this context if India being supported by Soviet Union gets involved in the internal affairs of Pakistan then time tested friendly country People’s Republic of China would stay beside Pakistan that is what the government of Pakistan expect. Mr. Bhutto wanted to return with the commitment of the Chinese leadership’s total support in this regard. PRC considered Pakistan as a friendly country so, PRC was also concerned with the Pakistan’s present political crisis. After the 2nd world war British Inperialism was forced to leave creating two countries called Pakistan and Hindustan deviding the Sub continent on the basis of ‘Two Nation’ theory. But from the very inception the ruling elites of Hinustan could not accept the dissection of their ‘Mother India’. Till this date that remains printed on the pages of ‘Nehru Doctrain’. Therefore, taking advantage of any opportunity that presents itself India would be engaged to erase the very existence of Pakistan that is a reality. There is no scope to deny this fact. Though unfortunate, we think the civil and military ruling elites comprised of the ramnents of feudalism and comprasor class who had been ruling Pakistan for last 25 years since its inception. had somehow have not been able to unite the people to evolve sense of Pakistani Nationalism on solid foundation in the multinational state. Misrule, exploitation, deprivation and socio-economic disparity becomes apperent the nationalism gets weaker and regionalism and separatism takes root. These two ominous symptoms exsist more or less in almost all the provinces of Pakistan. The present crisis in East Pakistan is the political manifestation of cumulated contradictions that it has with the centre for long. For the interest of our friendly country Pakistan our considered openion is that the present problem should be accepted as a political problem by the rulers and they should take the initiative to find a way out to resolve the problem politically in light of the will and wishes of the people of East pakistan. Any attempt to resolve the present crisis would be suicidal. We firmly believe that time has not yet run out to find a political solution through dialougue. After knowing our openion Mr. Bhutto went back and had narrated to Gen. Yahiya Khan just the opposite of what we said. He made Gen. Yahiya khan to understand that should the central government decides to take any strong measure to save East Pakistan from the internal caos and instability then the government of the PRC would provide full support to that. Not only that he further stated that in view of any strong measure if India gets physically involved in the internal affairs of Pakistan at that time People’s Republic of China would be prepared to launch a war against India for protecting the interest of Pakistan. He has come back with such an assurance from the Chinese leadership as well. Utterance of such lies and distortion of facts by any national leader is rare in the contemporary history. Being inspired by such false statement of Mr. Bhutto President Gen. Yahiya Khan and his military Junta in particular decided to end the political crisis through a genocide. They thought if a military operation is launched in East Pakistan and considering that to be an opportunity if Indo-Soviet axis start a war against Pakistan in that case America and its Europion allied powers and the Muslim world including PRC would fight against the Soviet Union and India unitedlly along with Pakistan. Such utterance of blatant lies and distortion of facts by any national leader is rarely found in the contemporary history. With such false presentation of Mr. Bhutto President Gen. Yahiya khan and his military Junta became enthusiastic to find the solution of the political crisis through a genocide. They thought if a military operation is launched in East Pakistan should Indo-Soviet axis consider that to be an opportunity and starts a war against Pakistan then America, its allies the powers of Europe, Muslime world including PRC unitedly will get into war against Soviet Union and India siding with Pakistan. In this kind of equation Indo-Soviet axis would be suffering a measurable defeat. At that situation it would be possible to annex Kashmir and dismember Indian Union into pieces. Thus, it would also be possible to wither away the charised dream of Indian Chanakya’s to regain their ‘Mother India’ for ever. At the same time Pakistan would be able to establish itself as the dominating regional power in South Asia. Such a perception can at the best be termed as nothing but day dreaming! I was simply astonished to hear what was narrated by one of the most powerful ealderly leader of Chinese leadership. The reason why this ealderly highly intelligent leader had revealed so much in details about Mr. Butto’s interaction with the Chinese learders was clear. The decision to invite Khaleda Zia has been taken at the highest level. She can come to China on a state visit any time at her convenience. After deciding the date and time once that is conveyed to the Chinese Ambassador at Dhaka all necessary arrangements would be made for her state visit at this end. About the agenda he informed that during the visit on behalf of the Chinese authorities she would be conveyed positive response. This is how the meeting came to its end and Comrade Xu Xing went away along with Comrade Ma after inviting me for the lunch. I came back to my room with Wu. I was in tension but that finished after the successful meeting. Both of us entered the room in a relaxed mood. I poured some Jesmine green tea in two mugs for Wu and myself and we sat face to face with the mugs. Dear Friend, you don’t know how much we all respect and love you. Would you like to know the reason? We have friends spread at every nook and corner of the Globe. But you being one of them is some what different. We have found some rare qualities in you. You are a genuinely selfless pro people patriot. Your political consciousness, far sighted acumen and your sphere of knowledge about the current flow of world affaires is astounding. Tou are straight forward, brave and truth seeking person. You are a rare individual above all lust and greed about worldy wants and needs. You are also a commited fighter for the greater interest of the humanity. Beloved old friend Wu was saying while sipping the green tea and I was listning silently. A charming young hostess came in and smilingly informed it was lunch time. She showed us way to the dinning room. At the door we found comrade Xu Xing and comrade Ma were waiting to receive us. Behind them I saw old friend comrade Fu, commissar of the PLA and good looking comrade Hong in uniform were standing. When I was in Beijing Hong used to be the interprator at the high level meeting at the Foreign Relation Department of PLA. He was attired the badges of Colonel on his shoulders. Hong had just returned from a visit to Bangladesh. After knowing that I was in town both Fu and Hong expressed their desi to meet their old friend so both of them have been invited for today’s lunch. Though we did not have the opportunity to develop intimate relation with your other colleagues and comrades in arms but even then we do have lot of respect for all of them as well. I shall now tell you something from my own experience the way the lotus magnificently unfold itself from murcky water similarly truth shall definitely be unfolded to the people one day overcoming all ill gotten attempts and adversities and that is when the people will look for and find out people like you to provide leadership in the struggle for national emancipation. We shall also be waiting for that day. Just be patient with firm conviction my friend, the call is bound to come one day. Comrade, you are an ealderly and experienced leader. Assessment of a tempered and prudent leader of your stature will remain as a source of encouragement to all of us. Be aware respected comrade, even that call does not come in our life time even then we shall left behind for the present and future generations the tale of our million martyers and the dream of the freedom fighters so that one day they can materialize that dream as a reality in Bangladesh. It is a difficult mission but not impossible that I have learned that lesson from the history of People’s Republic of China. As customary after the lunch comrade Xu Xing as the host stood up to make a short speech. Combaye(bottoms Up) and emptied his glass. Rest of us followed. Now, it was my turn as the guest of honor to say a few words in reply. I stood up. Honorable comrade Xu Xing and dear friends, I am very happy to meet my old friends over lunch today after a lomg time. Comrade Xu, you being an ealderly, vastly experienced and important leader of People’s Republic of China had considered to honor a very ordinary gust like me by hosting such a sumptuous lunch, this guesture of yours I shall remember for ever. You had also been kind to invite some of my very close and dear friends whose memory always remained fresh in my mind even after leaving Beijing for that allow me to thank you sincerely. The respected comrade had said, today I am returning with success. But I know behind this success contributions of my friends had been most vital. With out their sincere efforts my lone endeavor would not have been enough to achieve this success. Therefore, wishing good health of comrade Xu Xing and all those friends I would request you all to join me in a toast. Having said so, I pronounced loudly, Combaye and emptied the glass. Rest all folowed. The lunch came to its end. There after, every body left one by one including comrade Xu Xing. Has everything been fixed for the return trip? Yes, Haq would return by an late afternoon flight. All arrangement for his stay to night at Hong Kong has been made by comrade Lum. Arrangements for him to return back to the country tomorrow has also been made. I shall see him off at the airport. My dear, I shall not be able to see you off at the airport as I have some important matters to attend. But you would not face any problem for that as comrade Wu would see you off at the airport. Comrade Xu Xing has sent some gifts for you, our dear Bhabi Nimmi and Shosti to your room on our behalf. Convey our blessings and best wishes to them. Next time you must bring them along. You remain well, let me beg leave now. I thanked him for everything and embrassed him again. Ma immotinally patted on my back and then left. Before leaving he winked and whispered that everything of the agenda had been approved with financial assistance. You take some rest and get ready, I shall come in time to pick you up. I am returning today late afternoon. Day after tomorrow I shall have to take off for Dhaka. So, if you can get hold of the friends who so ever is present then can possibly arrange the get to gather at the country club. I would be staying at the Peninsula. Okay, I am arranging everything. You call me after reaching the hotel. By then I shall hopefully be able to finalize everything. In time, Wu after boarding the aircraft said good bye. CAAC flights are dot on schedule so we landed at the Kai Tak airport and reached Hong Kong on time. From the door steps of the aircraft Lum welcomed me and took me to the VIP lounge. One of his colleague took my passport and luggage tags and went out. Now tell me how was your trip? All your efforts can’t go in vain my dear friend. Listning to what I said handsome Lum laughted out. His colleague returned and said all formalities had been completed and luggages have been kept in the car. Day after tomorrow I shall come in time to pick you up and see off at the airport. Went away dear friend comrade Lum. It has been decided that tomorrow at 8PM we shall dine together at the country club. I shall come at 7:30 PM to pick you up from the hotel personally. You should be ready by then. Linda a mid aged charming lady full of life is the wife of my dear friend Robin. It is hard to guess the age of any Chinese man or woman. There is an old Chinese proverb, ‘before 40 no Chinese man or women is considered adult’. The average life expentancy of any Chinese woman and man is 97 and 93 respectively. This is because from the very child hood they strictly maintain a regulated life and their eating habits. They eat fresh and don’t take any stale food. This is the secrete of their lomg healthy life. Linda arrived at 7:30 sharp. Shapely Linda otherwise is pretty but she was looking gorgeous to night in her black Shiffon party dress. As I escorted her to my room she embressed her old tennis partner wormly. After a long time at your arrival all the friends are very happy. All who are present in Hong Kong enthusiastically accepted my invitation to meet you even cancelling their prior engagements. I find no change in you! Have you changed Honey? Rather, you are looking like a fairy to night! Strange! Your way of taking also remains the same as ever. You know, many still remember you lovingly even after you had left. We do talk about you at times. Have I been able to forget you all? Not the least. That is why even during this short transit I had called you to arrange a get together for meeting you and all other friends. But, Linda the way you are looking seductively beautiful to night I am seriously wondering, shall I be able to restrain my self not to cross the limits? Let’s move now. Both of us came down and the valle went to bring the car. Within minuites he drove back with a brand new convertable Marcedese 600 sports car. What’s up, I see you have changed your car? It is my habit to change my car after two to three years. Affordable only by the rich. Nothing, just wanted to figure out what is your time schedule to change friend? Don’t you ever compare yourself with others. You are my lifelong friend. Is that so? I am greatly releaved! Shortly, we reached to the most prestigious meeting place the country club touching the sea at the Repulse Bay. The exclusiveness of this club is that just only being a rich and famous none can be the member. One must also have a glorious family back ground. That is why the total membership of this club is around 200 families. Only exeption are the Hong Kong based heads of foreign Missions. Only they can be the member if they like. This is how I could be the member of this club with heritage. This provided me the opportunity to be aquented with most of the people at the top echelon in different sectors of Hong Kong’s society. How are you? I am realy very glad to see you after a long time. How are Nimmi and Shosti? Is Shosti playing Tennis? Shosti learned how to hold the Tennis racket and started taking basic lessons from Wang being her first coach. They are fine and Shosti is playing Tennis. Wang was happy to know that. Why don’t you come with your private Jet along with all the frinds on a Saffary trip to Nairobi as my guests? A great proposition in deed! George due to your kind curtesy we had visited most of the tourist joints around worth visiting. Now, the invitation for this VIP Saffary trip to Africa should not be allowed to slip out of hand what do you say? All of you. Keniya is a country of spring round the year so, any time is a good time. But if you come in August then you would be able to see the migration which is a wonder of the creator! Well then, we all are coming next August accepting your invitation. Linda will remain in touch with you as the co-ordinator in this regard said George. Yes ofcourse. ‘Three cheers for George Hip Hip Hurry’! Linda then informed all that this time I had visited PRC as the special envoy of Bangladesh’s Prime Minister and returning to the country tomorrow. Burt came closer and asked how was the trip? In short fruitfull I said. Haq would be travelling tomorrow so, we must call it a night now. Yes that we should do though getting him among us after a long time our hearts are unwilling to leave him said dear friend Lo Wi. I am also not feeling good to leave you all but even then I am undone.! I begged leave from all thaking for such a wonderful evening and came out with Linda. If you are not too tired then lets have a drive up to Stanly beach. You know some thing, in such a beautiful night if a fabulously gorgeous lady as you are looking to night make such a proposal to a dead man then he would say ‘Forgive me my Lorad’ and will stand up to oblize my dear so, refusal is impossible. You know when I am in a pensive mood I remember your such amussing and witty utterances and then I really miss you a lot. The symptom is not good dear, Dr. Robin must be apprised so that he can arrange proper treatment. What do you say honey? I couldn’t care less that you know that very well. Rightly so. We both laughed out. Thanks a lot everything specially for this wonderful night, stay hail and hearty my sweety pie. Now you better go as it is already quite late and you are not used to late nights. Yes, that’s correct. Good night, she kissed my chicks and drove back home waving her hand. Well then you better take some rest. I would be informing you shortly where and when Madam would like to have the meeting after taking to her. Nimmi wanted know how was the trip and welfare of the friends and their families. Visit was fruitful and the friends are keeping well. The Chinese friends had invited to visit China along with you and Shosti at our convenience. Linda and others will be coming for a Saffary trip as our guests next August in George’s personal Jet. Madam decided to meet you alone at the cantonment house at 10PM. It seems that your Madam has learned well the tricks of the trade from his late husband. It was mainly due to you and Sabbhi everything happened and now she wants to know the result of the trip from me alone leaving you both aside. You were very much required when the request was made to me. Why is this brother? Neither I have any clue about this nor can I say anything. It went well you can say. Your desire had been fulfilled, in this context it can be said the visit was successful. I knew you wouldn’t return without success. You know many things therefore, you are enhancing your credentials selling me. Any way leave this aside, All the common friends that you got introduced before returning to the country they had conveyed their good wishes to you and your family. Is it? Really, at your request whatever they had sincerely done for us that made us dumb founded. Quite natural because, In their dictionary of friendship pretention and ungreatfullness these two words are not there. Now listen to my earnest request Kamal, in future you will not get me involved in any such matter till your Madam proves herself true to her commitment that she had made. Meaning by till the time she brings us back to the country to lead a normal life. Up till now what all you have done for her even after that you think that she will turn away from her commitment? In countries like ours those who does unethical power politics mostly think themselves like fishes with long life. Their only aim is to survive in the corridor of power as long as they live. For this and to leagalize all their misdeeds and lies they depend much on two most well versed sayings. The first one is, ‘When required then you are the Boss but once the job is done then you are the most unpalatable’. The second one is, ‘There is no last word in politics’. Your Madam has just got into seat of power. Let her realize the strength of power only then you will be able to know her real face. What I feel or not that’s not important. But what is important is the apprehension of the close Chinese friends about her promise or commitment. They think that khaleda Zia just like her late husband will not confess the truth about the association of Gen. Zia with 15th August and will never allow us to return to the country to take part independently in the national politics. Because, in that case her own and BNP’s politics will be finished. She has no head ache like Gen. Ershad about Col. Faruj and Col. Rashid. Reason being she knows it very well that we are the main organizers of Sena Parishad. Faruk and Rashid are not involved with Sena Parishad. Sena Parisad had made only a tactical alliance with them in the anti Mujib uprising. She also knows the fact that it was I who convinced Zia to be the central figure of the secret organization which was formed during the liberation war which later after independence became Sena Parisad. Therefore, she can never allow me to move around in the political arena beyond her control. She would certainly consider that as suicidal for her and her party. This is what the Chinese apprehends. Whether this apprehention is correct or not only time will prove that. The apprehention of the Chinese friends can’t just be brushed aside. Should you be interested to dwell on this issue more in details later some time then we could talk. I kept the receiver on the cradle. Why did you honored me with ‘Present Arms’? I am casually dressed and came driving the car myself, how could you recognize me? Did you see me before? I can’t recollect if we have served together! Yes Sir I have seen you in China. The first batch of officers and men who were sent to China for training in light weapons and tactics under the leadership of Sayed Iskandar I was also in that batch. You came all the way from Beijing to receive us. There after you came to visit us quite a few times. You used to discuss sincerely with all of us about our facilities, difficulties and all other problems and used to try to resolve those at your best. Being a well known senior officer holding high position the way you were affectionate and caring had overwhelmed us and we all started respecting you from the bottom of our hearts. Sir, the way you used to explain different complicated issues in simple language none of us has forgotten that. The subedar was talking immotionally with sincerity. People with character like you shall bring more tribute and highten more the image of the armed forces that we have raised with our own hands within and outside in future for sure. I drove the car to the porch and got down. One of the driver took away the car to the parking place. I found the same Mr. Falu in waiting to receive me. He showed the way to a sitting room and requested me to be seated and wanted to know what I would like tea, cofee or cold drink. Little later Khaleda Zia entered the room chewing Paan Masala. We exchaned Salam and sat on the sofas. Through the intercom she instructed Mr. Falu I suppose not to transfer any call or send in any visitor as long as she is holding meeting with me. She also asked him to send in tea and snacks. Tea and snacks were not required as I just had my dinner. I camped at Minu Fuppu’s house. From there I am moving around visiting relatives and friends. Quite natural. I have come to know you being originaly from Dhaka, besides your relations the circle of you friends and aquentences is widely spread. Tell me, how was your trip? The outcome is positive? The Prime Minister raised the main issue. What Kamal said have proven to be right! No, Nothing. I am thinking how shall I thank you. As a government servant for the interest of the country and the nation I had tried my level best to implement the assigned task for that I don’t deserve any thanks from the Prime Minister. Your sense of self respect and expressions are very acute and sharp! With that comment she made a cup of tea and handed over to me just like Gen. Zia. Bhai, please stand beside me as the Senior Minister. Same old emrarrasing request again! I was thinking what should I say while sipping tea. After thinking for awhile as I looked at her I found she was staring towards me expecting a positive reply. I was embarrassed with that look. Bhabi please don’t mind, you had made this request before as well and I had replied to that clearly as much as I could. This is an unrealistic proposition. It would not bring any good to either side rather might become cumbersome. Better would be to materialize the commitment that you have made at your won to make the opportunity for us to return to the country to persue our politics freely that would be far more better for both sides. There is no other alternative to sustain the politics based on patriotism, Bangladeshi nationalism and progressive Islamic values. There was a clear sign noticible on her face of frustration so I changed the topic and said, should you allow then I shall like to give you a personal advice though I know you have no darth of able advisors. Bhabi, in every field the personal relation at times can do miracles which can not be achieved with formal relation. As the head of the government it would be worthwhile to develop personal relation with the invisible powerfull individuals in the corridors of power in the major capitals. The amount that you would be spending in this regard the friends in return will arrange much more than that. Because, how and in which way those funds can be achieved that can not be found by any Ambassador, Foreign Minister or any expert in the Foreign Ministry. Those blind allys are on the finger tips of those invisible powerful people. Besides, even in America decision made by any competent authorities can’t be changed that is not correct. Take for example, what was told by the American Ambassador to your Foreign Minister regarding your visit to the USA that is a usual practice but in a particular case this might not be applicable. If that is the case then from where and how to begin you think? My view is if you decide to take any shuch initiative then you should start with America, the present world pariah. If you do so then it would be lot easier to develop such relation in the capitals of North America and Europe. But you must give utmost importance to Cino-Bangladesh relation always for the interest of Bangladesh. Are you personally prepared to help me in this regard? Is it be possible to arrange a state visit to America at the shortest period of time? For the interst of the country I can give it a try but what would be the out come that does not depend on me alone so, can’t be said anything for sure. That is quite natural. Then on return you do whatever you deem appropriate in this regard. If you consider it is necessary to post you as the Ambassador to USA to work in this regard then I would be even ready to post you there. No Bhabi, nothing could be done in this regard being posted there as the Ambassador. Because, any Ambassador there has to work remaining within a limited sphere. To develop such relations secrecy is an absolute pre-requisite condition. Then you go ahead as you like. I shall provide whatever is necessary to you maintaining absolute secrecy. Well then, once I go back I shall go on a visit to America secretly. Before I leave you have to give me a signed note verbal mentioning me as your special envoy and some funds. You will give you detailed account of all the expenditure. Besides, you have to give me a few signed letters of thanks. Note verbal and the letters I shall write myself and bring those to you for signatures only. For that I need a few pages of your official letter head and envelops. After two days you cam call me then I shall come and get them signed and sealed in front of you and return with the fund. Then come to the residence at 10PM after two days. I shall be waiting for you. Let me take leave now. Okay. But, from now I shall have to be careful not to thank you for anything isn’t it? I came out without replying anything. I came back home. Next night Kamal called and informed that the Chinese Ambassador had met the Prome Minister on urgent basis and returned after knowing all the details about her visit. Thai’s good, you as the Principal Secretary would have the opportunity to visit People’s Republic of China as the member of the VVIP deligation. I am thinking duting the visit I shall try to meet the old friends. No don’t try to do that. Even you try, you would not find them. The mistry men always prefer to stay behind the scene. In such a high profile visit you would it would not be possible to find their where abouts. While talking with Kamal I could not understand whether the Prime Minister had discuss with him about my next assignment or not. After two days at the appointed time I got the note verbal and the letters of thanks signed by Khaleda Zia and returned with the money. I did not talk on this matter with any one at home. Before leaving for Nairobi, I had to go to the residence of Kamal with Nimmi over a dinner. We two were the only gueats. The atmosphere was very homely. Kamal’s wife took Nimmi to another room to gossip. That provided two intimate friends the opportunity to to talk open heartedly. Well, Dalim would you mind if I ask you some thing? Why such modesty my dear? Go ahead. Though I had been intimately associated with you and Nimmi’s family during liberation war in ’71, even then some how I feel I have not been able to know you correctly! Why? Nothing about me was unknown to you. That’s true, rather I must say you always stood beside me and shared all my happiness and sorrows like your kith and kin. Khalamma loves me like her son and Bappi, Nimmi and Manu aslo address me as Bodda. I also consider myself as one of their family members. The amount of selfless love and affection that I have received from all of them is thousand times more than what I got from my own parents that I can say with pride. After the war same kind of relation developed with your family that also I shall confess with out any hesitance. During the war I noticed you were a much talked about as an exceptional personality in every circle. You could very easily establish yourself as an fairytale idol in the battle field due to your uprightness, valor and exceptional courrage. After the war I saw you are well known in every tire of the society. Amazingly I found you also have intimacy and friendship with the most of the leaders and the workers in the political arena regardless left, right or centre! I have also noticed being a member of the armed forces you are also very close to many top nauch politicians, intellectuals, journalists, businessmen, community of teachers and professors, even have intemecy with many powerful bureaucrates. I don’t think it would be possible for me or any other person to attain such envying self identity countrywide, what is the reason for this? The reason, conscious patriots like you all along confine themselves within a specific parameter. Remaining within that parameter whatever risk is viable you all take only that much in your endivor to serve the country and the people. On the contrary, I and my other colleauges do not care for any parameter this is the main reason. Any thing that you do is well calculated considering personal safety, losses and gains. Where as, we are like free birds beyond all these. We do not know how to compronise on ideals and principles, have you understand my dear? Yes. Now, one more question on another issue. During the war when Zia was withdrawn from the sector and dumped at the headquarters I have been witnessing from that time you all had shilded him in post independent period as well. After the successful revolutionary uprisings of 15th August and 7th November it were you all who brought him to the center of power I know even that. But why that very Zia had betrayed you so ruthlessly? Human mind is like a pearl. Any moment it can change and people can turn their eyes. Let me ask you, Sargodian Kamal Siddiqui a brilliant student of Dhaka University staunch leftist later became a carriarist CSP officer! There after a freedom fighter during the liberation war, after independence again an influential and powerfull bureaucrate with bright future, all these are change of mind is ib’t it? After usurping absolute power revoving Justice Sattar why Gen. Zia mingled your name with Danish journalist Piter Custer and forced you to be a fugitive? You are not the type to turn the table against him, then why did Gen Zia compeled you remain underground protected by Haq Bhhai, the reknowned revolutionary? Later with lot of lobbings and begging excuses and spending some time in the Jail you managed to be reinsteated in the government service and had served the same Zia all these are also due to changes of mind. Strange! After all these your perception about Zia’s suspicious mind and treachery(Munafiqat)is not clear to you that I am finding hard to believe my friend! Any way, now being enthusiastic with lot of efforts and lobbying (Tadbirs) you have nmanaged to secure the most lucrative post that is Principal Secretary to the Prime Minister to salvage the nation. On the other hand, when BAKSHALITE President Sheikh Mujibur Rahman after sacking us from the service applying draconine PO-9 himself had tried to buy us with various lucrative offeres, we all had declined those politely. This is also a difference between you and us. How far the cherished deam of ’71 your Masam will fullfil that time would say but the prized appointment that you have managed that would surely increase your demand and pricein the International market of bureaucrates. You would be able to encash that any time that is required. Tou also know this quite well. This is also one of the well calculated moves. 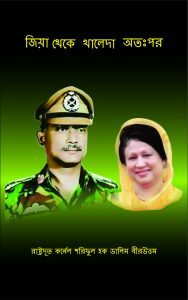 We think Khaleda Zia will trodd the same foot prints that of Gen. Zia. Therefore, It shall never be possible to materialized our charished dream of ’71. Zia being one of us after compromising with India sacrificing national interests termed us and the members of the Sena Parisad as conspirators and anti state eliments, there would be nothing to get surprised if one day, I am again sacked by your Madam with an similar alligetion. At that time you would also carefully maintain a distance from me brother. Then why have you been doing so much for her? Whatever we deem appropriate to promote our dream and the interests of the country and the nation we are doing that. In the process if Zia, Ershad or any one else even your Madam is benifited personally that is not our concern. So, you may say whatever till this date we might have done or doing that is in our own interest if you like. It is not possible for anyone to know your depth by looking at your outer self! Secrecy is the pillar of success having said that both the friends burst into laughter. listen, I am revealing some secret to you considering it might be helpfull to you in future. Your Madam has earnestly requested me to help her to develop some kind of personal relations with the invisible pillars of powers on the corridors of power in the capitals of America and Europe. In this venture you have been kept in dark till now! Not only that she emphesised that this matter should only be kept between we two. Is that so? Strange! What did you say? Whatever you do be carefull. Would you reply to one last qruery? Say, what do you want to know? Did you have any prior information that Manzur is going to take such a step against Zia? You are spying for whom that I don’t know. But I hate lies so I am forced to remain quite. This is my reply. I know that you were aware about that to great extent. Is it a particular reason to become Principle Secretary to Khaleda Zia? You may reveal if you like whether I am right or not. But, nothing to be afraid of my friend, I am not going to pass it on to your Madam ever. I hope you have that much of trust on You can trust me that much for sure. Kamal did not say anything. Well understood. Now before leaving, I would give you some important food for thought to understand Zia’s family. After taking over Gen. Ershad had issued order to freez all the personal bank accounts of all the immediate family members and party accounts of BNP. This caused serious financial crisis to Zia’s family. The reason being Zia after usurping power very carefully kept himself aloof from any financial corruption though his pet words were, ‘Money was not a problem’. He also did give any oppurtunity to his near relatives to get into corruption. You are aware that he hardly allowed his relations to swarm his residence. But he gave open licenses to his party leaders to do corruption to make money. He used to raise party funds in that way at the same time used to have a file with him against each one of them prepared by the DGFI. This is how cunning Zia ensured his clout over used to treat his party leaders like his pet dogs. Taking the advantage of the family crisis RAW sponsored two companie’s buying houses at Dhaka employed Sayed Iskandar and Tareq Zia as the share holding executives with lavish purse. Besides, Col. Mustafiz Rahman, the Foreign Minister as Capt. Served in the ISI along with Zia for about two years. He is Zia’s coursemate so considering him a man of confidence your Madam has appointed him as the Foreign Minister but she does not know that Capt. Mustafiz is now working on the pay roll of RAW to protect the interests of Indo-Soviet axis. Barrister Moudud is also now RAW man. According to the rule of business it is not fair to ask for the source of any information. But you have all the right to verify the authenticity of any information through your own sources. If possible try to save your Madam from the clutches of the RAW agents for the greater interests of the country and the nation. The saga of, ‘Broken suitcase and torn vest’ has been thrown away long ago by the Zia family. The evil omen of corruption is swallowing Zia’s family fast, you understand my dear friend. Kamal was swallowing my words with his potruting big eyes. At that particular time perhaps Kamal was finding it hard to absorve what I had been saying. But with the passage of time Kamal was able to gather proofs about the truth what I revealed on the basis of facts. It was quite late at night so we called it a night and came back home. Within a few days after that we returned to Nairobi via London. This was my last meeting with Kamal.